2m of soft warm fabric, 3m if you're tall/wide. I got raw silk from a medieval fayre @ £6 per metre and it's absolutely lovely. Fold your fabric into quarters. Make sure that you can see the wrong side of the fabric at this stage. Cut a very small, sqaure head hole. It should be no more than 1 inch deep and two inches wide. This will make it 2"x4" when unfolded. Cut out a square for under your arms, making sure that the fabric remaining will be a generous fit, even once hemmed. Unless you have particularly gangly arms, you should be able to get away with using the finished edge of the fabric as the cuff, saving time and effort. Unfold to a T shape, so you're seeing either all of the front or all of the back. 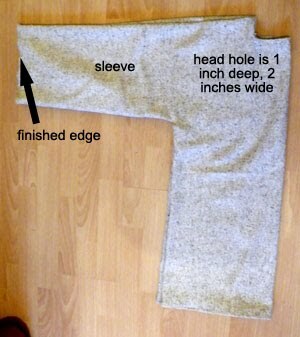 Sew together under the sleeve and down the sides. Hem the head hole. You'll need to make snips at the corners so it will fold over neatly. You may need to reinforce these corners carefully if you have a fraying fabric. Turn it the right way out and wear it. The reason for the long sleeves, high neck, and generous fit is so you can wear thermals, jumpers or whatever underneath. T-tunics will be the staple of Odyssey.